Yumi Yoshiyasu (left, crew) and Maddie Hawkins (right, helm) on Lake Erie from Day 2 at the 2018 U.S. Junior Women’s Doublehanded Championship. Photos by Erin Gallagher. MENTOR, Ohio (July 29, 2018) – Another great week of junior women’s sailing came to an exciting conclusion Sunday on Lake Erie. It was an especially exceptional weekend for the team of Maddie Hawkins (Edgewater, Md.) and Yumi Yoshiyasu (Houston, Texas) who claimed the Ida Lewis Trophy at the 2018 U.S. Junior Women’s Doublehanded Championship, hosted by Mentor Harbor Yachting Club. It was the second consecutive win at this US Sailing National Championship for Hawkins who won this title last year in Annapolis, Md. Forty teams of two in the Club 420 featuring young women sailors, age 13-18, wrapped up an action packed week in Mentor, Ohio for three days of racing Friday through Sunday, two day of clinics on Wednesday and Thursday with a strong cast of coaches from around the country, and a series of social events and experiences throughout the week in the greater Cleveland area. Hawkins and Yoshiyasu were incredibly consistent all week. They won four races and placed no worse than fourth, despite a 10th place finish in Race 10, which was their throwout score. The team of Colleen O’Brien (Fair Haven, N.J.) and Michaela O’Brien (Fair Haven, N.J.) stayed close all week with Hawkins and Yoshiyasu and sailed at a high level throughout. They won Race 9 and 10 to close out the weekend in second place, just five points back. Vanessa Lahrkamp (Rye, N.Y.) and Katherine McNamara (Darien, Conn.) took home third place honors. As part of the event, MHYC showcased their community to the sailors and their families. 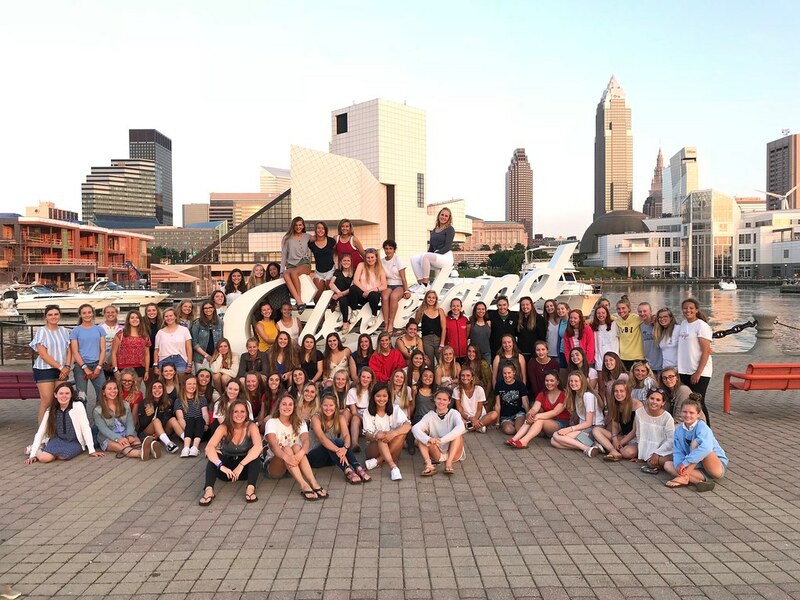 The young women toured the Rock ‘n Roll Hall of Fame followed by a dinner excursion in Cleveland. Sailors enjoyed a Lake Erie beach luau, Shrimpfest, sunset yoga, and Italian feast after racing each day. Visit the event website for more information on the Championship. Take a look back at the updates from the race course using #idalewis18 on Twitter and social media. The 2018 U.S. Junior Women’s Doublehanded Championship is sponsored by Gill North America. Support of the U.S. Junior Women’s Doublehanded Championship as well as the clinics is made possible by funds provided by the late C. Thomas Clagett, Jr. to perpetuate his unwavering dedication to junior women’s sailing. This support is intended to encourage young American women to enhance their sailing ability, with emphasis on sportsmanship, by providing the opportunity to compete in national-level competition with guidance from high-level coaching. Tom Clagett’s family continues to assist in fulfilling his vision. The U.S. Junior Women’s Doublehanded Championship started in 1995. The Ida Lewis Trophy is the perpetual trophy presented to the winning team. The C. Thomas Clagett Jr. Sportsmanship Prize was awarded to Emma Friedauer (Powell, Ohio) and Samantha Hemans (Costa Mesa, Calif.). The Most Improved Award went to Isabel Smith (Birmingham, Ala.) and Evie Blauvelt (Atlanta, Ga.). Race 1 at #IdaLewis18 in the books. Tough race as the wind lightened during the finishing window and many boats were scored TLE (Time Limit Expired). Local sponsors also stepped up to support this prestigious event. The Inter-Lake Yachtsmen’s Fund sponsored the opening night dinner on Tuesday. The North Coast Women’s Sailing Association and Edgewater Youth Sailing Foundation co-sponsored the Power Talks round tables, which will feature the six professional coaches discussing various tips and tricks in quick 10-15 minute rounds. University Hospitals is a local sponsor who sent a registered dietician to discuss teen-athlete nutrition at a breakfast sponsored by the Inter-Lake Yachtsmen’s Fund. Hawken School, in Gates Mills, sent a new Strength and Conditioning Coach, Kris Lewandowski, to discuss best practices for strengthening, conditioning, and controlling body movement for optimal endurance while sailing. Mentor Harbor Youth Sailing Foundation’s donors sponsored the Sunday awards dinner. Cleveland’s own Sailing Inc., Quantum Sails Cleveland, and The Cleveland Foundry donated resources to support the event. All guests are being hosted by MHYC’s generous members and friends, creating an unforgettable camaraderie for the week. This US Sailing National Championship is participating in the Sailors for the Sea’s Clean Regattas program. Mentor Harbor Yachting Club is a world-class private yachting club celebrating its 90th anniversary this summer, in Mentor-on-the-Lake, Ohio. Situated directly on Lake Erie, the Club has offered sailing and boating education to its members and the community since its inception. MHYC is home to the USA Junior Olympics Sailing Festival for Ohio, and recently hosted Laser singlehanded national championships in 2016 along with many other prestigious regional keelboat events including Falcon Cup, Mentor Regatta and powerboat events. MHYC’s mission is to provide the highest levels of member enjoyment and satisfaction. For more information, please visit www.mhyc.us or contact General Manager Jaime Cordova at 440-257-7214. The Club is located at 5330 Coronada Drive, Mentor-on-the-Lake, Ohio 44060.